Born in Abia State to business woman, Helen Alade (Nee Uzoma) and Police officer, James Alade, fast rising Nigerian Pop sensation Yemi Eberechi Alade was the fifth of seven siblings in a household that was filled with music from day one. Yemi Alade is the young undergraduate of University of Lagos studied Geography, who two years ago scaled from 174 position to emerge winner in the maiden edition of Peak Talent Show. She has finally graduated from the university and in this interview with chinyere amaechi says that she will fight on until fame embraces her. Yemi was educated at Saint Saviours British Primary School, Lagos and then Victory Grammar School, Lagos, before proceeding to the University of Lagos. 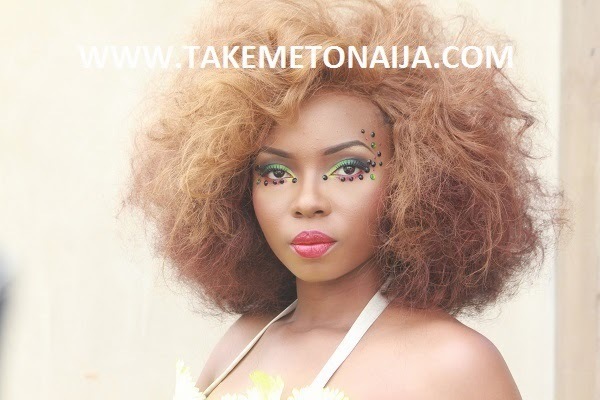 “I am Yemi Alade, an artist, performer and I love music. Some say I am a songstress others a diva but in all, I am Yemi Alade. The fifth of seven siblings, Yemi, has four brothers and two sisters. Yemi grew up listening to popular music of the late eighties and early nineties, and began singing in her church choir at the age of twelve and was known to have made melodies from everyday conversations. In her words I have practically lived my life on stage, Yemi was exposed to singing and dancing competitions as a child. She grew up in several Nigerian cities owing to her fathers job description. Yemi was educated at Saint Saviours British Primary School, Lagos and then Victory Grammar School, Lagos, before proceeding to the University of Lagos where she majored and graduated with a BSc in Geography in 2010. Yemi began making music professionally in 2005, then, under the supervision of Bayo Omisore, she went on to win the maiden edition of the Peak Talent Show in 2009. Her debut single Fimisile featuring eLDee peaked commendably with over ten thousand hits on YouTube in barely a month. In July 2012 Yemi Alade released GHENGHENLOVE ,produced by the Legendry OJB , which is now a monster Hit and also has a video for the track directed by Gambit Pictures , with the executive director Taiye Aliyu(CEO effyzzie music Group), also in 2013 Bamboo shot by Director Frames . Currently on Youtube in less than one month, Yemi Alade’s GhenGhenLove video has 20,000 views and counting. She has also released songs like birthday song and My head O!! Produced by Shadybizniz, Uche Face featuring L.O.S and produced by EL-MCEE, also Bamboo produced by Fliptyce , Faaji Produced by T-Flava, GhenGhenloveRemix Ft Iceprince and Sasha P produced by OJB and Show Me produced by OJB again. Currently at work on her yet to be titled debut album, she has made the rounds in the industry; performing on over one hundred stages across Nigeria, featuring on tracks with major acts such as Dipp, IcePrince, ELDee, M.I, Sauce Kid, Shank, Sir Shina Peters, Waje, Wizkid, Yemi Sax, to mention a few, plus working with big and budding music producers; OJB Jezreel, ELDee, E. Kelly, IBK, MajorOne, SizzlePro, DJ Klem, Bigfoot, Shadybizniz, Dtunes, Nomoreloss World renowned South African producer; Garth, and Flip Tyce. Yemi Alade is signed to Effyzzie Music Group as at 2013 and she also dropped another hit single same year titled Johnny (prod by Selebobo) which made a lot of waves a lot in 2013/2014. In her words she explained how one of her singles JOHNNY gave her more fan and likes in Nigerian and outside Nigeria. ““So who is Johnny, Yemi Alade?” “Is there a Johnny in your Life?” “have you found Johnny?” These are just a few questions I’ve been getting from curious fans and radio presenters; the story doesn’t end there though. A little less than 6 weeks ago, Effyzzie music Group (the record label I am signed to) and I,went on a nation wide media tour to promote my new singles “birthday song and happy people (my head oh)”. The first point of call from Lagos was Port Harcourt,and that was only after 10 days of non stop radio interviews in Lagos and not to forget the 100 cakes spree we embarked on .We had given our 50th cake to Hip TV and 51st to an orphanage in Ilupeju. She has been nominated for different awards and also won awards like; NEA awards and others.